With the distraction of Hallowe’en at the end of October, it’s easy to overlook how quickly the truly big day creeps up on you: that’s right, Devilled Egg Day, on the 2nd of November each year. Don’t feel badly; it catches so many people unprepared for it. 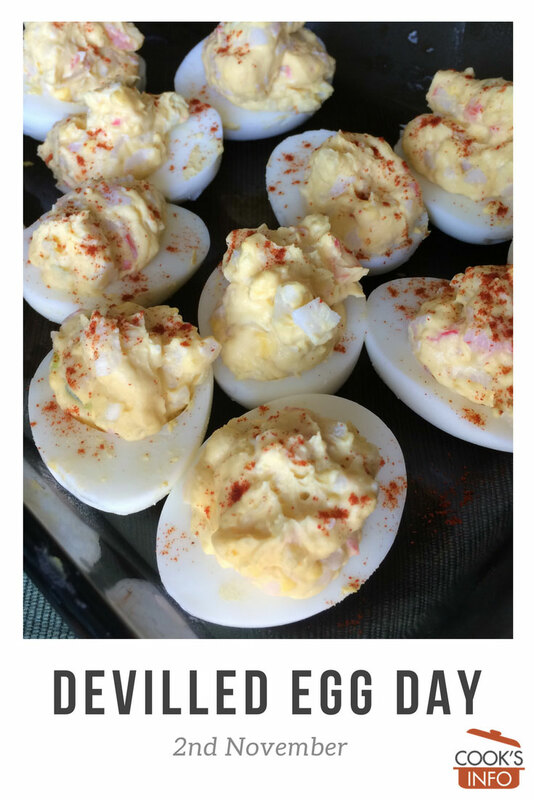 For several decades now, Devilled Eggs have slowly been forgotten in the heady onslaught of more buzz-worthy foods such as gluten-free this and guaranteed GMO-free that. Nobody thinks about them anymore. But put out a platter at a party, and just watch people hoover them up. Time was, they were everybody’s favourite food. Not so much work that making a batch would throw your whole week off, not too fancy as to be show-offy, but just fancy enough that they looked special on a bed of lettuce greens with some sprinkles of paprika. Hasn’t it been too long since you’ve had a Devilled Egg? Why not treat yourself today? And while you’re at it, CooksInfo.com can answer your questions such as how did they get their name, how long have we been making them, and how on earth do you boil the eggs so that they don’t come out blackened or pock-marked? While you’re nibbling on your eggs, raise a toast today to North and South Dakota. On this day in 1889, both states joined the American union.